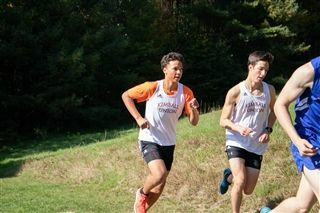 The Wildcats traveled to St. Paul's School for the Lakes Region Championships. The girls came in sixth place out of eight teams and the boys came in fifth place out of ten teams. Alisdair MacPhail (12th place, 18:24), Nate Brooker (13th place,18:30), Kohki Shinohara (28th place, 19:48), and Jonathan Bruner (30th place, 19:58) scored for the boys' team. Having all four of those scorers under 20 minutes is a wonderful accomplishment. Eleanor Ashton (10th place, 21:53), Rachel Xia (22nd place, 24:52), and Nancy Tran (23rd place, 25:06) scored for the girls' team. The majority of Kimball Union Academy's athletes had their season's best performance (in terms of time) on this flat and fast course through the woods. We return to action on 11/10 for the Division III NEPSTA Championships.